Expect a legendary list comprising liquid history at the serene Greenhouse, which now has a sensational new chef at the helm of the naturally lit kitchen. In total, sommelier, Elvis Ziakos, who has a fine collection of Prince of Wales checked suits, oversees more than 3,400 bins at this leafy, luxurious haven, amassed with patience and strategy. To an innocent bystander, such a venerable list may appear intimidating. However, Ziakos has humility, and aside from the aged icons starring on his list, there is plenty of interest even sub £50 a bottle, and even the odd bargain, such as Sine Qua Non’s Stripes and Stars rosé, which is cheaper here than retail. Born into a “gastronomic” family, Ziakos who is Greek and has performed in the Best Sommelier of the World competition for his country, recalls his father, “bringing back frogs’ legs and wild boar.” One of his favourite hobbies is history. “Etymologically, the word ‘gastronomy’ is derived from the Ancient Greek, ‘gastḗr’ (stomach) and ‘nomos’ (‘laws that govern’). Thus, “the art or law of regulating the stomach,” he says. Of the Adonis of a chef, Alex Dilling, in the role since August 2018, Ziakos says, “without the chef, we can’t sell wine,” adding, “in Greece, wine and food are like a wedding!” Dishes by the London born, USA raised and American of accent, Dilling are probably the prettiest in London, and Ziakos refers to their style as “purity of richness”. Dilling, who is formerly of Alain Ducasse at Adour, New York, and Hélène Darroze, London and internationally, notes The Greenhouse was his grandfather’s favourite London restaurant. Similarly, made by Alex Gambal, the offspring of a car park entrepreneur in Washington DC, organic, “higher altitude” St. Romain, an appellation which one merchant describes as having an “off-Broadway address,” brings floral perfume to a passion flower-esque dish of tender white asparagus with razor clam velouté and cockle roes. 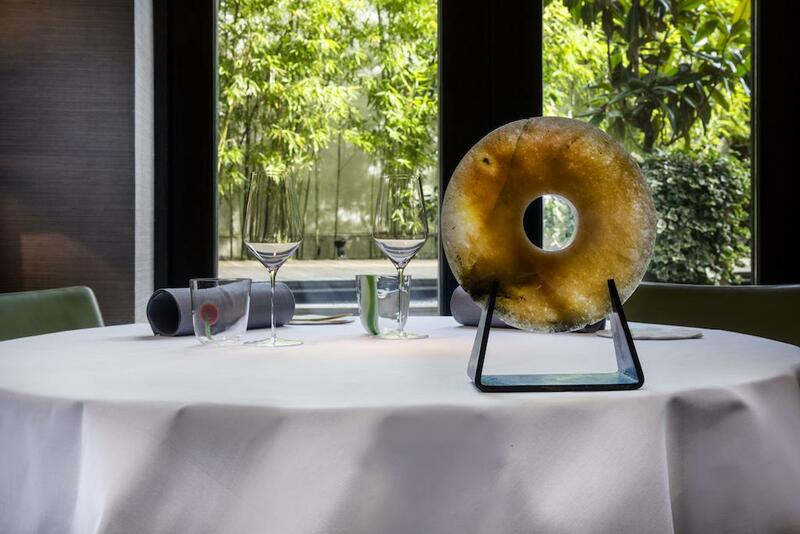 Exceptionally finely tuned, The Greenhouse is part of Lebanese restaurateur, Marlon Abuela’s classy portfolio, which also comprises Kyoto inspired UMU, The Square, members’ club Morton’s, Marc Patisserie and Bakery and OW Loeb fine wines. Born in Greece, Ziakos studied at Le Monde Institute, working as head sommelier at the coastal Kohylia restaurant at Grand Resort Lagonissi followed by Spondi in the city, before moving to London to join the team at Marcus Wareing at The Berkeley. ‘I have won many awards as a sommelier, including representing Greece at the Best Sommelier of the World competition,’ he says. Dishes by Arnaud Bignon, who trained under Eric Fréchon of the three Michelin-starred Le Bristol in Paris, and, like Ziakos, also worked at Spondi, may include, from the tasting menu, veal sweetbread with pineapple, black sesame and ginger, then brill with onion, banana, kaffir lime and dukkah, or from the set lunch, piglet tandoori with pak choi, carrot and lemongrass, followed by kiwi, bergamot and buttermilk, possibly with Massandra Ukranian sweet wine, for a taste of history. This supermodel of a collection is curated by sommelier Elvis Ziakos. On it, cool oceans of Chablis include a startlingly large François Raveneau vertical, which would add citrus zip to classically-trained chef Arnaud Bignon’s subtly Asian-influenced, French-rooted dishes, including wild turbot with golden matcha tea and cauliflower. Burgundy listings are, overall, eye-poppingly exciting, with older vintages of these and iconic Bordeaux being in plentiful supply. The huge listing of Penfolds Grange dating to 1961 must be one of the largest in existence. A list that struts with its chest puffed out and head held high – pretty much peerless.